This category can only be viewed by members. To view this category, sign up by purchasing Bachelor, Master, Bachelor (lifetime), GBU Personal Concierge Service (3mo), Associate, Associate (Lifetime), Gunbot VPS hosting by GBU (up to 3 instances, 6 exchanges), Gunbot VPS LITE hosting by GBU (1 instance, 1 exchanges), Gunbot VPS PLUS hosting by GBU (1 instance, 1 exchanges) or Gunbot VPS PLUS hosting by GBU (1 instance) 3-month pack. With the market doing what it’s doing (once again), and given that we’ve had a few new faces join us (welcome! ), I’d like to take this opportunity to make a few statements that will be familiar to those “Crypto Veterans” that have been around for a few of these, may serve as a much-needed boost for those who are new, and may just be common sense for the rest. If you go into something with the proper expectations, when things like this extreme bear market happens, not only are you prepared, but you’re simply better off. I’m sure we all have our reasons for why we have Gunbot and why we got into crypto, but more likely than not, it has something to do with disruption of some kind – disruption of the banking system – disintermediation of one industry or another. Maybe you wanted to get rich because you heard of someone else doing so. Or maybe it was the technology you love. Why DID you get into crypto? Is it the same reason you got into Gunbot? (and if you’re not into Gunbot, contact us and we can help answer questions – either hit the chat button down below or go to https://gbu.run/feedback). After you have your motivations in check – you probably should see where you are, time-wise. We’re in crypto. The industry itself hasn’t even been around for a decade. So few people know about crypto, care about crypto, own crypto or are involved in crypto. 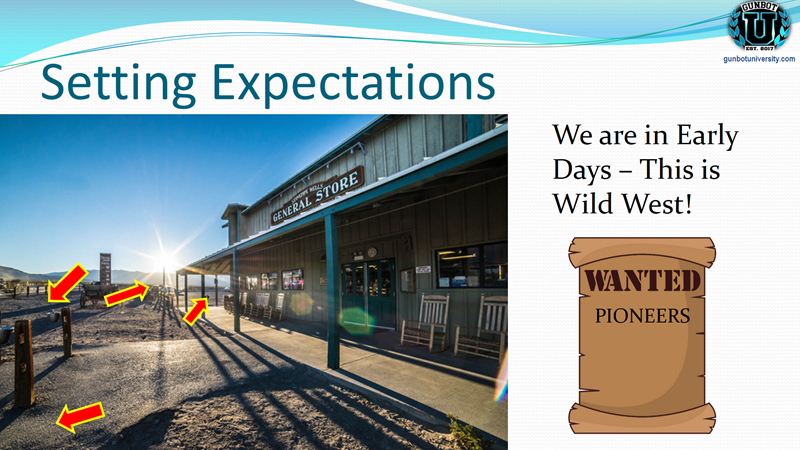 We are in the early days, and we’re still in the Wild West. Gunbot, and Crypto in general, is for those kinds of people. Frontiersmen who appreciate luxury but don’t require it. For they know there’s gold in “them thar hills” and are willing to go through a lot to get to it first. If you’re new to this space, you might be kicking yourself… as you might have bought in with Bitcoin at an all-time high (ATH). 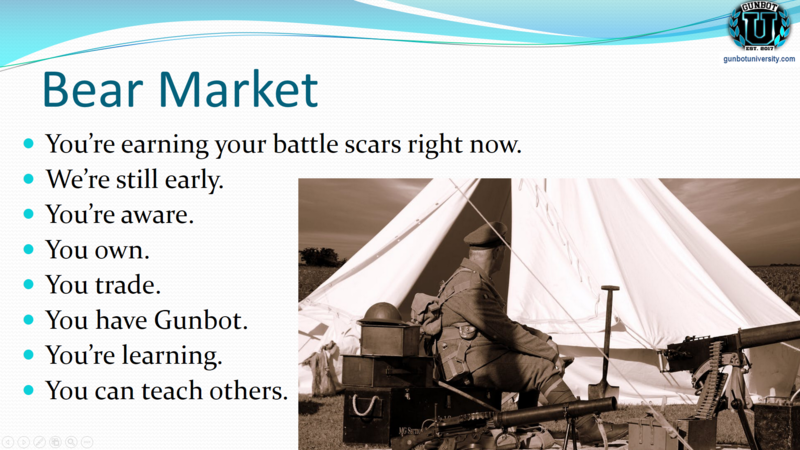 You are earning your battle scars right now. We’re still early, with such a low percentage of the world citizens aware of crypto, owning crypto and trading crypto. 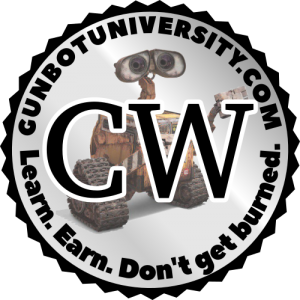 The fact that you 1) are aware, 2) own, 3) trade, 4) own gunbot* and 5) are improving your education here at GBU… these are all amazing indicators for your future. It won’t be long until you are the veteran. This space moves fast, and is growing even faster. New people are coming in, new FIAT is coming in (where else is it going to go?) and the more veterans we have to help guide them, the better. Help continue the education. again, possibly – unless you don’t, in which case, reach out and we can help. It’s only a loss if you sell. Paper losses are temporary. If you bot with money you don’t stress about, then you won’t stress so much during these times. Conversely, if you’re botting with money you need, then you will definitely stress about botting. Therefore, _don’t bot the rent money_. If you’re thinking of selling your crypto, try to remember how thin the order books are. 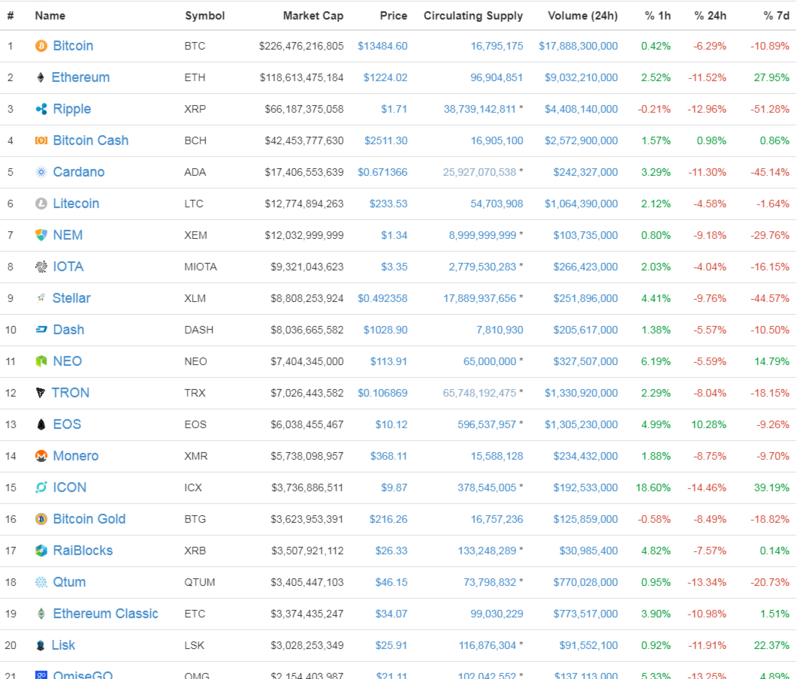 What this means is — the representation of “price” on coinmarketcap.com or any of the sites that report price is based on the order book, and is subject to heavy manipulation. The price can move in an instant due to volume, big whales, unregulated markets, and heavy hands who know what they’re doing dominating a lot of people who don’t know what they’re doing. Try not to be one of the people who don’t know what they’re doing. If you *know* what you’re doing when you sell your crypto, then by all means, sell, especially if it’s at a profit, or if it’s for another crypto that makes sense for you. If it can go down this fast, it can also go up this fast. And you don’t have to just imagine – just look at the history. This exact thing has happened several times in the past, and every time, it has done so over and over, and then risen again even higher. So, if money is your thing, maybe waiting it out is a good play. 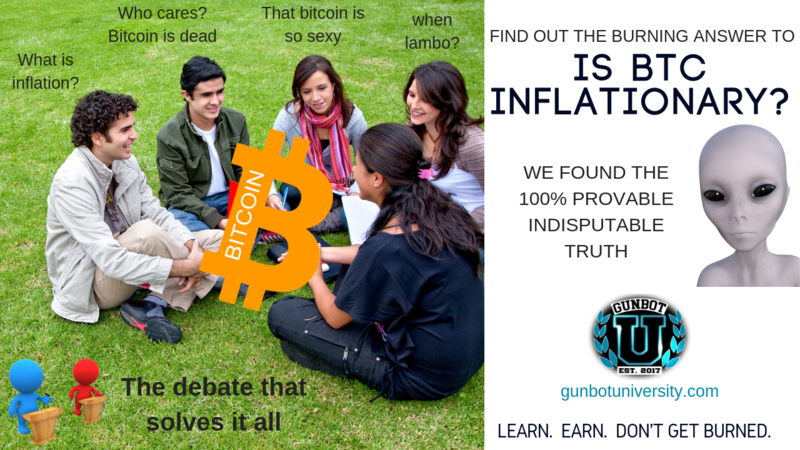 If you want to earn crypto, you can always do so at GBU – we not only have an affiliate program at https://gbu.run/affiliate where by referring people to Gunbot University, you can earn affiliate bonuses, but also we reward content creators, so if you’re interested in writing articles or making videos about Gunbot, we pay in crypto (revenue share model). Big sea of red. You’re getting bags. Your “portfolio” on the exchange is dwindling. You might feel like panic selling. You’re seeing tweets of people selling and you’re wondering if you need to do the same. The masses are like a cat following a laser pointer on the carpet. The market falls down, so they fall with it and panic sell. They are praying to whatever gods will listen — PLEASE BUY MY COINS!!! The market goes up, so they say hey, let’s buy! 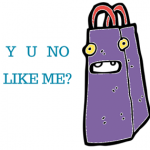 No, no, No, NO! That’s the opposite. The experienced trader removes the emotion and BUYS when the market is down and SELLs when the profits are high. This big sea of red is when I do my BUYING. This is why you keep Bitcoin in reserve. This is when all the sales happen! Everyone else is emotional, panicking, losing their shirts, and willing to give you their precious coins at a fire-sale-unheard-of-deal-price-of-a-lifetime! But the money… it’s gone! Yeah, I know. My portfolio is down by a huge amount, too… if I look at USD valuations, that is. But if I look at the number of coins I have, it’s still the same number*. Well, I ask you to look at two things. Look at what you think the future of crypto is. First, if you look at the history of crypto, you’ll see that there are a lot of stairsteps where it went up, Up, UP, thendownalittle, then up, Up, UP thendownalittle, then repeated. Second, look at what you think the future of crypto is. If you think we’re at the beginning stages and early days of crypto, then you needn’t worry. Your own instincts should tell you to HODL. The cycle will pass. Let me tell you how I see the current cycle. Gunbot keeps making me more BTC. Every trade, I increase my Bitcoin position inch by inch. Every day, I go for as many trades as I possibly can. Every so often, the cycles repeat. Try to keep emotion out of it, and try to remain calm during the storm. Marvel at those around you who are willing to sell their coins to your Gunbot or your manual trading. And if you have an extra account that can do some manual trading, get out there if you have the spare funds and answer their prayers. One way I do this is I go to whatever exchange I feel like has the volume — and then I sort by coin loss. Then I look for long-term coins or coins that I might really have a decent bounce. For example, on Bittrex, I can go to Wallets or the list of all coins and then do a reverse sort on % Change. It’s definitely not a great metric since it’s a 24h metric, but if it’s all you have, and you don’t have Coinigy, Trading View, CoinTracking or something else, you use what you have. Then I look for the ones with the dips that have recently slowed down. I like UKG – this is a perfect time to pick some up! If I feel like HODLing then I just leave it in my account, or I set some dream LIMIT SELL orders for high amounts — I make it so that people need to convince me to get rid of my coins. If I feel like making money on these coins, I set a LIMIT SELL order for whatever percentage I think will spring back – 5%, 10%… because in this season of crypto – these feel like they will spring back. Now, I have to caution you – I’m pretty cavalier with my attitude here because I’m currently playing with “house money”, since I’ve been so conservative in the past, and have been so cautious. I can let it ride some. Next up – Steem Dollars (SBD) – that looks like an EXCELLENT buy! I did the same with bundles of MANA, WINGS, VOX, STORJ and a few others. We’ll see in a few hours, or tomorrow, or maybe next week if this was a good idea or not. It can be a scary world out there, and there are real dangers. But the more you know about the world, the less scary it can be. 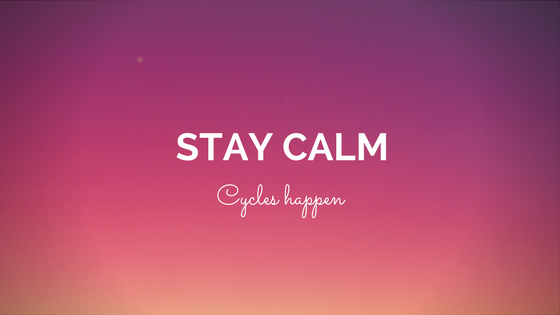 If you’re prepared, you can be ready for the natural cycles of crypto ups and downs and better yet, you can capitalize and make the best of them. Even while writing and updating this article with pictures and editing paragraphs, the market is already re-correcting and some of the coins I bought are profiting. Bags are clearing. The sun is coming out. I have a feeling that the people who panicked will wake up and regret their panic sell orders, and maybe we can help them understand how to stay calm for the next time. We don’t have to feed off each other. NOTE: The author of this article is not a financial advisor and this does not constitute financial advice, even though it’s a little scary. I said it was the same number, but I hope it’s clear that the statement doesn’t include trades, manual buys and sells, deposits, withdrawals, etc. In fact, because I’m a Gunbot user, overall I’m profiting and increasing my BTC because that’s what Gunbot does — it uses a BASE (BTC) to purchase a QUOTE (some other coin) and then later sells the QUOTE for more BASE. So, over time, if everything goes as planned, I have more BTC. Whether or not the BTC itself is “worth” more FIAT is a different story, and whether or not that is a desirable trait is yet another story. Many times, when the Bitcoin price goes UP, people rejoice because their portfolios go up (yay! 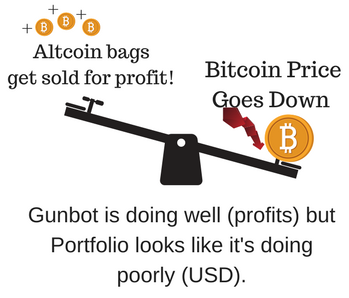 ), but they forget that it usually means that ALTCOINS *in relation to bitcoin* go DOWN, which means either Gunbot trades dwindle (reduce in frequency), or, worse, bags occur (gunbot purchases a coin at an “high price” and holds onto it for a long time, unable to sell at a profit. And then, when Bitcoin price plummets, they cry about it. But then they make all these profits. Such is the cryptocurrency see-saw. 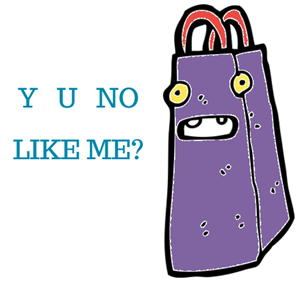 Bitcoin price goes up == people get happy because they’re richer, but sad because bags happen, or not so many trades. Bitcoin price goes down == people get sad because they’re poorer, but happy because bags get removed, or more trades happen. It’s like they can’t make up their mind whether to be happy or not. Or put another way – some people? They can’t be happy no matter WHAT happens. They complain, and complain and complain. From January 2017 to about October 2017, Bitcoin’s rise was volatile, sure, but not near as volatile as November and December 2017. The swings were epic. A $5000 swing in one day?!??! This is why Gunbot University Professors recommend important safety measures ahead of time and know your exit strategies before you start botting, and before you dive headfirst into launching your bot with default configurations. LISTEN. When things are good, you will be popping champagne and ordering new cars and pumping your fists in the air. 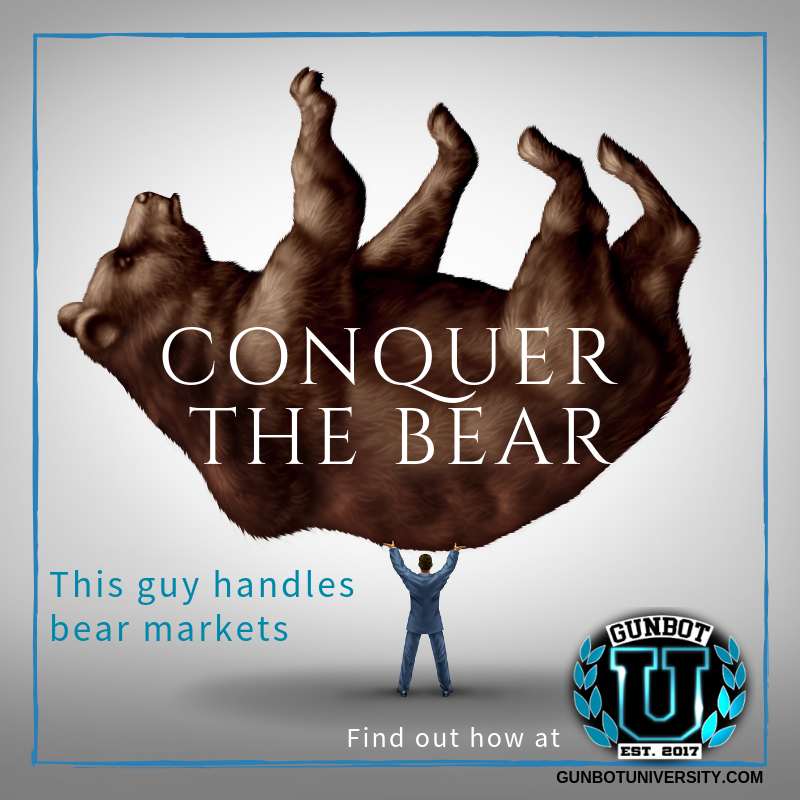 But as soon as the bear market hits (and it will, several times over), you will be looking for everyone to blame – maybe Gunbot, or the Exchange, or who you bought Gunbot from, or who introduced you to CryptoCurrency… anyone but yourself. These tips will help keep you from losing some of your cool when the bad times hit. Be ready for them. If you spent all your bitcoin on feeding gunbot, and gunbot ate your lunch because the price of gunbot shot towards the moon, and you were greedy and ran bullish settings on way too many coins, and gunbot ate up every coin in sight, and then you were thinking – hey, the market is doing great! look how good BITCOIN IS DOING!!!!! And then you have all these bags. Because then you look at Poloniex or Bittrex and you see red all over the place. 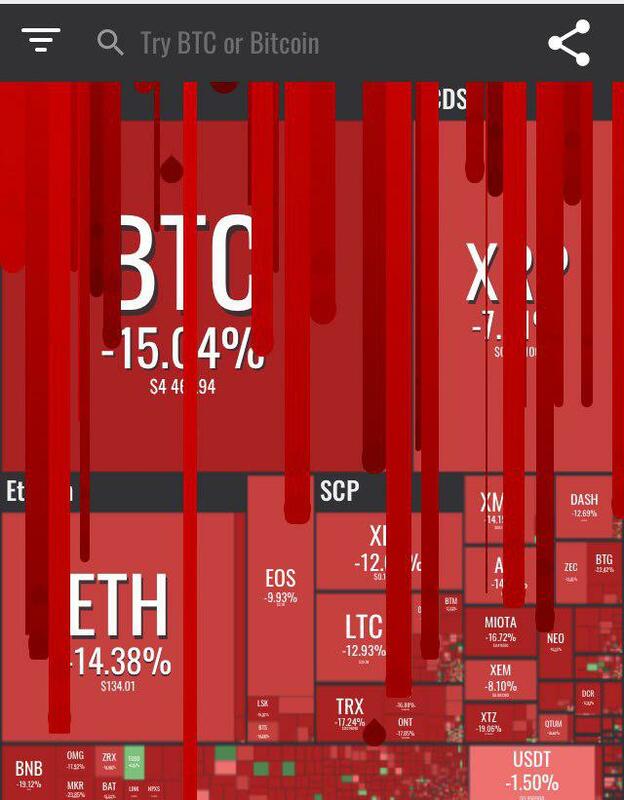 That’s because it’s red IN RELATION TO BITCOIN. A lot of people in this situation lose their cool and decide to sell off their altcoins to try and get bitcoin back. But if they just wait.. a lot of times, Bitcoin will fall again, or each coin will go through their individual rise cycle, and the bag may clear. Which is why the “Dry powder” is keeping enough bitcoin aside to reload gunbot. The lesson here is – you don’t have to give Gunbot all your Bitcoin, all at once. Keep a lot of it in reserve. I, for example, only give Gunbot 7-10% of my Bitcoin to work with. I want to be able to replenish it when it runs out. When bags happen (and they will, often! 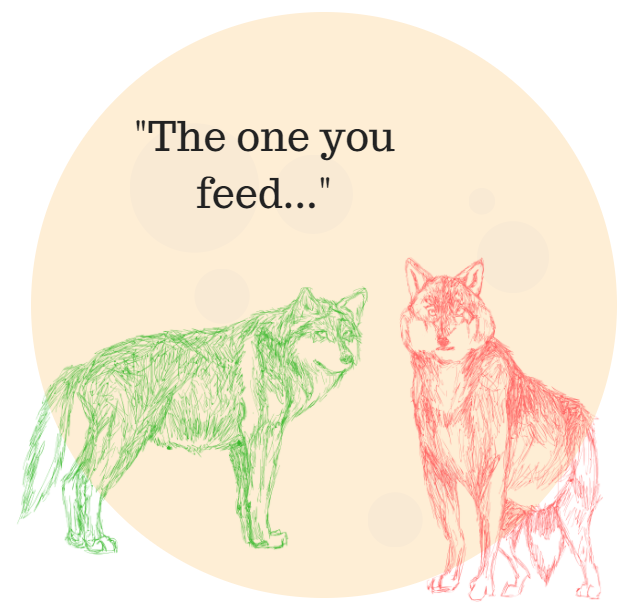 ), you need a plan for what to do about them. It’s better that you figure this out ahead of time, and hopefully you’re starting out slow and with small amounts, so you can get a feel for what this is like with easy situations instead of hard situations. The first thing you can do about bags is avoid them in the first place. Some settings are “bag avoidance” oriented. For example, if you have buy settings that are smarter, such as buying on Bollinger Band with “-5” or “-10” where it buys below the BB band, then it won’t buy often, but it’s a “smarter” buy. Also, if you have TSSL as a sell strategy, with a very fast trigger, such that you get rid of the coin quickly, but are able to ride the profit range, then you won’t collect as many bags. Each of these choices has its own advantage and disadvantage in terms of how much investment of your time and other resources you have to make, and whether or not it fits with your own philosophies of trading. If you do nothing, Gunbot won’t trade on that pair. It’ll patiently wait until it can sell the coin back for a profit. This requires the least investment of your time, other than you looking, staring at the red, and wondering when Gunbot is going to act, or wondering why you used those settings. You may invest some time fretting at this point. Depending on how long you have a bag, doing nothing is usually what everyone does, and is what everyone should do. It depends on your level of patience. Gunbot needs time to work its magic on trades. 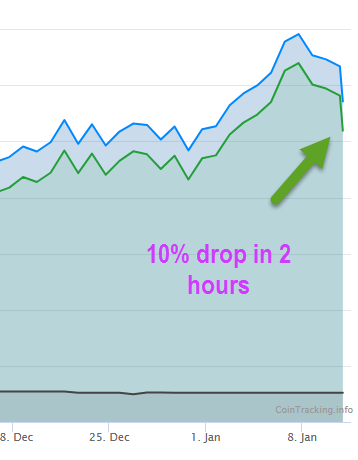 Some trades only take a minute or two to turn around a percentage or two of profit (very rarely, I might add). Most trades take longer. If you’re holding a bag for longer than a few days, that’s when you might turn to the other options. Some Gunbotters feel that it’s better to cut loose a coin as soon as it’s lost a certain amount of value – say, 5% or 10%. I have zero experience in this realm of thinking as it is anathema to my entire being. I do not ever sell at a loss. I believe we are early enough in crypto that enough coins are still surging, or I can use Averaging Down as an option, that selling at a loss does not work for me as a philosophy. But since there are enough people doing it, I wanted to mention it as an option, even though I cannot advise much about how it works or how to justify it. Gunbot supports an option where if a coin loses a certain amount of value since it purchased it, it will sell it off. I think the idea is that it would be better for Gunbot to re-enter the market at a new price point after a certain amount of lost ground, and then re-farm that new price point over and over. That way they’re not sitting and waiting for the price to recover to the bought price, which may never happen. While I can see the math part of that – taking a 5% loss now so that gunbot could then do ten or fifteen possible 1% profits later, the volatility of bitcoin, to me, paints too many worst case scenarios. I can see gunbot buying a coin, then bitcoin mooning so quickly that all the coins drop 5%, and gunbot sells them at a loss. Then gunbot re-buys when it recovers and then bitcoin moons again, repeating the process. I don’t see a stop-gap in place to prevent the continual bleeding of bitcoin when this is in place. If I saw this presented on paper, or in a spreadsheet, or maybe with actual trades or a console log, maybe I could get behind it, but for now, I cannot support selling at a loss. For me, the bottom line is — it’s not a loss until you sell. Wallybagging was a term coined by another Professor early on (May 2017 timeframe) for a technique I used where I would move the bags that Gunbot created from time to time from one account to another account, either at the same exchange or another exchange. I would then set a limit sell order on the other exchange to either get the profit I wanted, or set “dream sells” to get higher profits, and then wait as long as it took. Since crypto was and is still booming, this became an investment plan of sorts. I gained these crypto coins at a very cheap cost – and I ended up getting my bitcoin returns on most of them anyway. The ones that didn’t, I still usually got my USD returns. 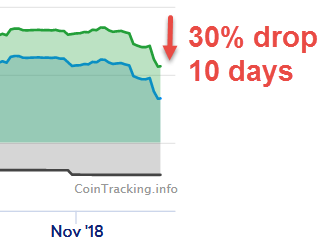 There were a few that I didn’t get any returns on, but the vast majority (90%) of coins received profits in this manner. All while keeping gunbot happy. Now, because I moved the bag over to another account, I had to feed more bitcoin into the Gunbot account… which is why “Always keep dry powder” was important. Had I given all my bitcoin to gunbot in the first place, I wouldn’t have any left over to feed it. This worked very well with Gunbot Versions 2.x and 3.x. With versions 7 and up, I haven’t yet performed extensive testing with Wallybagging since this version retrieves trade history of the coin(s) to get purchased price. Before using Wallybagging on version 7 or later, I’d verify first or wait for an article or two from me on it to make sure the procedure doesn’t make Gunbot sell at a loss or something due to coins being bought but not being sold in the trading history (due to being transferred out). Double-up, or Averaging Down, is another way to handle bags, and is one of the most effective, most profitable ways. However, the first thing that must be said is that it requires a large bankroll, and you must be willing to keep your trading limits lower than you normally might use. Double up is not for everyone! 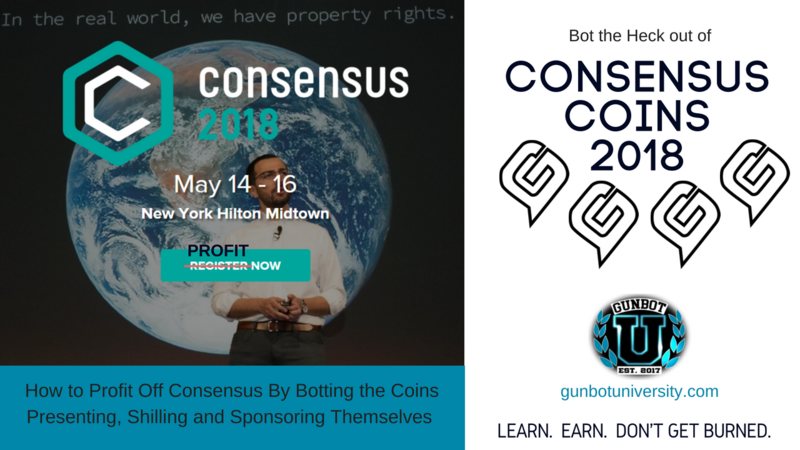 Double up works like this – Gunbot buys a coin. 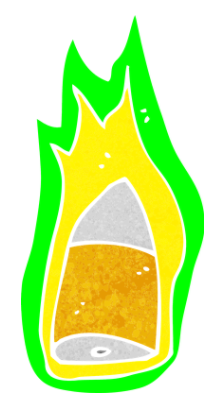 If the coin behaves normally, fine. Everything works like it should. But if the coin starts to lose value and it becomes a nasty bag, then instead of the other three options (doing nothing, selling at a loss or moving it out of the way), Double Up option decides to invest MORE into the coin. By investing MORE into the coin at a lower price, it lowers the average cost of the coin. A lower average cost of the coin means that the coin no longer has to recover all the way to the original bought price – it only has to recover some of the way. 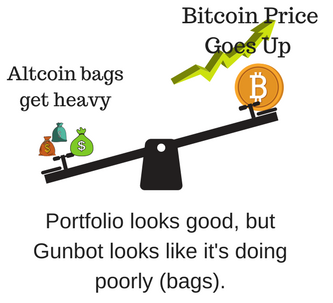 If the coin continues to tank, then, depending on your settings, Gunbot will invest even more — DOUBLE what it did last time. It’s digging it’s way out. This can get VERY expensive VERY quickly. You can specify the multiplier (100%, 150%, 200%) and a cap of how many times it will double up, but there’s a trade-off. If you make these too low to save money, you reduce the effectiveness of the solution and you may limit the capability of the Double Up feature to dig you out of the hole. Then the bag you have ends up being just really heavy and you have to wait for the coin to recover. When you use Double Up, be sure to use a LOT of BTC (or funding currency) in your wallet and low trading_limits, and few coins. Try it out for a while before putting into place everywhere. Like Double Up, this is a trading strategy that one must fully understand before it is employed. 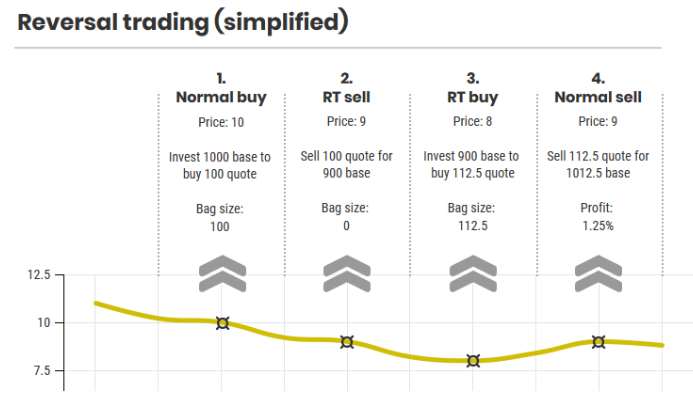 Reversal Trading was first made available in Gunbot v9. Where Double Up keeps buying exponentially larger amounts at lower prices in order to reduce the Average Bought Price, in the hopes the coin will rise up and eventually sell for a profit, Reversal Trading sells the bag at a loss now, makes a note of it’s own actions, and then re-enters when the price has gone down a certain amount, reducing the Average Bought Price some. The hope is that the coin will recover enough to cover previous “sell at a loss” and take advantage of the lowered Average Bought Price. Reversal Trading (RT) is an innovative technique that Gunbot uses to offer the user another option for holding bags, but it is not something to be used casually. 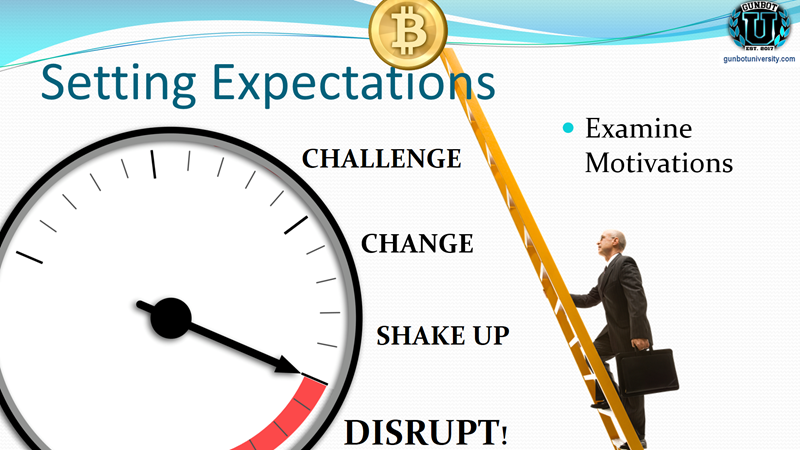 There are several caveats when it comes to proper configuration, and expectations about managing a coin’s trades. An old Gunbotter is teaching a new cryptocurrency newb about life. “A fight is going on inside me,” he said to the newb. Continue reading "Gunbot can drip, but sometimes you need the firehose"